Rila hails from Brazil and is a wild-hearted protector of the wilderness and forests of the Amazon. She relies on her speed, claws, and bite attacks during combat. 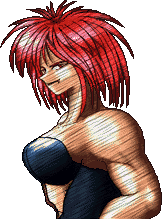 In the 1994 prototype of Breakers, titiled Crystal Legacy, she was known as Virgo Sandra, which was later given to her clone counterpart. Fun Fact: Rila's clone counterpart, Virgo Sandra, is a woman who was entrusted to the "forest tribe" as an orphan and was raised by a giant snake. She possesses the so-called "Green Gem". Her surname, "Sandra", comes from the village where she lives. We found Cham Cham's mom! lol. Why do all the "jungle people" have the same spiky hair? 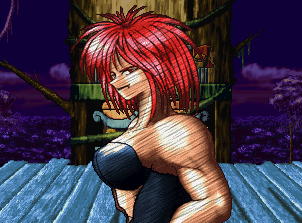 The Breakers developers pretty much went and made a female Blanka... (or Cham Cham's mom). Well, at least Rila doesn't fight exactly like Blanka... although most of her moves are kinda boring and typical 2D moveset fare. Visually, she's mostly generic. Not to sound perverted, but I think a design of her type would've gotten better results with less clothing? (You know, more like Felicia perhaps.) Rila's attire just makes her look like a buff female wrestler... but I don't think that's what they were going for exactly. Rila is a sleeper design that's missing something.